A well-cared for, well-maintained septic system will remain clear and free flowing for many years. If you neglect your system, it will eventually clog or fail which will lead to large costs or even system replacement! A failed septic system is costly and will become a health hazard. 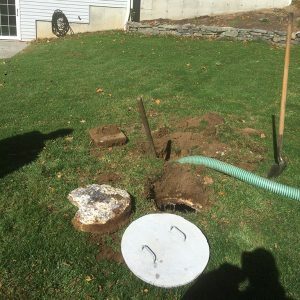 When we clean your septic tank we first evaluate how much scum and sludge has accumulated over time. We then break up the scum layer and mix it into the liquid. Once the scum is released, we then stir the sludge up with the remaining liquid and remove everything remaining from the tank. Sometimes, if there are a lot of people living in the house or your tank hasn’t been cleaned in a while, it may need to be backflushed. Backflushing is where we actually pump some liquid back into your tank during the cleaning process to dislodge heavy or caked material so it can be vacuumed out. Before closing the septic tank, we check the inlet and outlet baffles to be sure they are properly in place. If they are not intact, they will need to be replaced so that your septic system will function properly. Inlet and outlet baffles are in place so that the scum layer must stay in the tank and can not clog a line or go out into the drainfield. To help with future cleaning, a Riser should be installed on the tank. If you do not know where your tank is located we can help you. We acquire an “As built” from the town if available. If not, there are a couple of options available, from probing the ground with a metal rod to find the tank, to flushing a sensor down the toilet and following it with a hand held device that tracks the signal to the septic tank. Your septic system consists of a septic tank and absorption area. The purpose of the septic tank is to collect all water coming from the household (bath water, laundry, toilet waste, etc). Solids settle to the bottom while scum and greases rise to the top of the tank. Between the two areas of solid waste is liquid, which is allowed to pass through the baffles (pipes) into the absorption area. Bacteria from the septic tank and from material entering the septic tank work to break down scum and organic matter. Inorganic and hard to decompose material remain as sludge at the bottom of the septic tank. By cleaning the septic tank regularly (on average once every two years) and being careful about what is put into it, a system will work well for many years as long as it has been properly installed. When a septic tank is not cleaned at the proper intervals the sludge layer increases, filling the tank. It may then overflow into the absorption field clogging it and causing system failure.